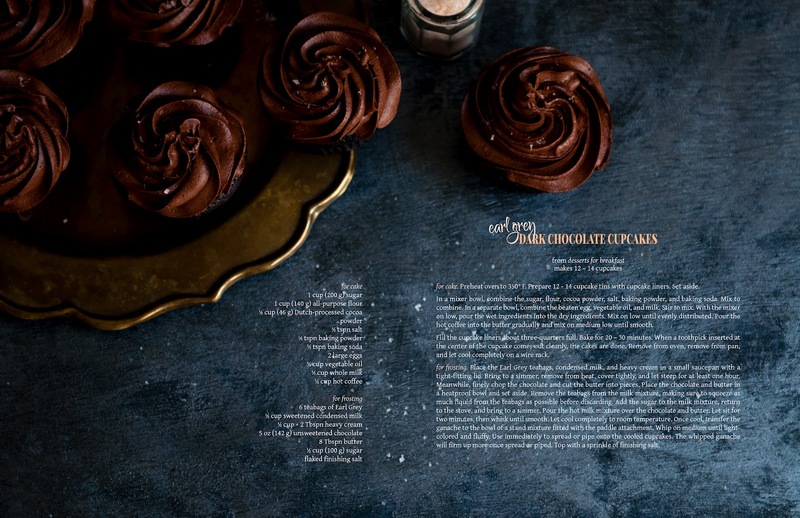 Desserts for Breakfast: Announcing sated magazine! 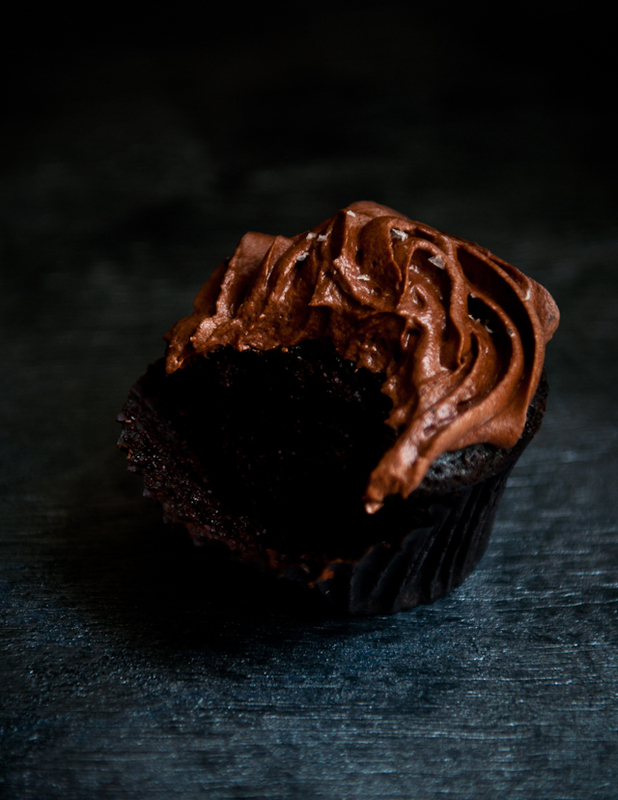 and Earl Grey Dark Chocolate Cupcakes and a giveaway! 1. for cake. Preheat oven to 350° F. Prepare 12 - 14 cupcake tins with cupcake liners. Set aside. 3. In a separate bowl, combine the beaten egg, vegetable oil, and milk. Stir to mix. 4. With the mixer on low, pour the wet ingredients into the dry ingredients. Mix on low until evenly distributed. 5. Pour the hot coffee into the batter gradually and mix on medium low until smooth. 6. Fill the cupcake liners about three-quarters full. Bake for 20 – 30 minutes. When a toothpick inserted at the center of the cupcake comes out cleanly, the cakes are done. Remove from oven, remove from pan, and let cool completely on a wire rack. 7. for frosting. 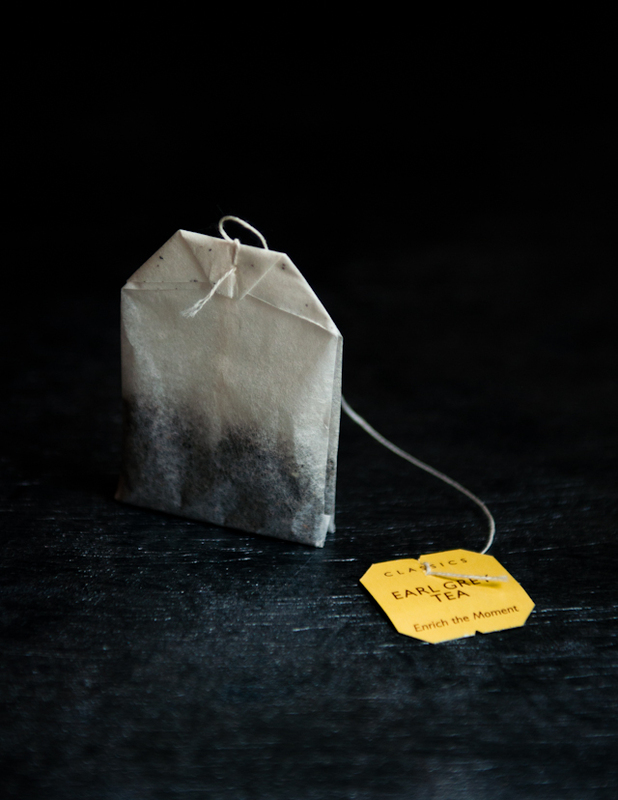 Place the Earl Grey teabags, condensed milk, and heavy cream in a small saucepan with a tight-fitting lid. Bring to a simmer, remove from heat, cover tightly, and let steep for at least one hour. 8. Meanwhile, finely chop the chocolate and cut the butter into pieces. Place the chocolate and butter in a heatproof bowl and set aside. 9. Remove the teabags from the milk mixture, making sure to squeeze as much liquid from the teabags as possible before discarding. 10. Add the sugar to the milk mixture, return to the stove, and bring to a simmer. 11. Pour the hot milk mixture over the chocolate and butter. Let sit for two minutes, then whisk until smooth. Let cool completely to room temperature. 12. Once cool, transfer the ganache to the bowl of a stand mixture fitted with the paddle attachment. Whip on medium until light-colored and fluffy. Use immediately to spread or pipe onto the cooled cupcakes. The whipped ganache will firm up more once spread or piped. 13. Top with a sprinkle of finishing salt. wowow! the publication looks beautiful-the photos are stunning-but the recipe for the earl grey dark choc cupcakes would have been enough! well done-amazing! These cupcakes look amazing!!! :D Thanks for the giveaway! A magazine dedicated to chocolate sounds like heaven! And so do those cupcakes! Suoer cool news. Excited for you!!! Congrats! The pics are lovely. Congrats on your new magazine! It looks so nice! This publication looks sensational, as do the cupcakes. I wish you and Anita all the best with your ventures. Good luck with the new project! The mag looks great! This is so exciting!! Congrats ladies!! I like sated on facebook. ohmywordthissoundsamazing! Seriously. amazing! oh and those cupcakes sound pretty bloody fabulous too! how exciting! And what a great first issue. I love chocolate and earl grey as well, can't wait to try these! Congratulations! I'll start saving up my calories so I can bake a bunch of chocolate recipes in May! Congratulations! You must be so proud. The magazine looks beautiful, and the cupcake I can't wait to make. Love your blog, which means I'll triple love the magazine! Very excited to see it! Congratulations on your new venture. Looking forward to the first issue. I love this recipe. I will make this tomorrow! How exciting! Love the name of the magazine and the inaugural topic - dark chocolate. Oh my goodness this is so exciting!! I am a die-hard chocolate fan and I am so thrilled for you! Your photos are pretty, gorgeous and I'm so excited with the idea of enjoying more with your new publication. I'm sure ¡¡¡It will be amazing!!!! Thank you. Dark chocolate. My favorite. Good choice for your premiere issue, if I do say so myself. oh, WOW! Those cupcakes look amazing. So does Sated! This magazine looks good. I'd be interested in taking a look. How fantastic! Congratulations and I can't wait to check it out!!! Making the cupcakes today and Sated is beautiful! dark chocolate, cupcakes, earl gray tea, and a give away! what could be better! this is extremely exciting. Oh it looks beautiful! I can't wait to see it, i'm sure it will be just gorgeous! Well done! Sounds like a fantastic project. Congratulations! I love the mini stand the cupcake is on. Oh I wish I could get your brand new magazine. I'm such a fan of your blog which improve my english also (i'm french) and give me ideas to cook / bake ! OMG! Muy favorite tea and chocolate! And the amazing photography!!!! thanks for the giveaway! Congratulations on your dreams becoming reality! I look forward to reading this magazine - and what better way to begin than chocolate?? Those cupcakes look amazing! And the cover of Sated looks beautiful as well. This is fantastic. The photos are stunning, evocative, and mouth-wateringly attractive. Good luck to all of you as you progress forward with this exciting venture. As I just posted on Anita's blog, I'm really excited for your new magazine! And wow. This sneak peek is absolutely gorgeous! I am definitely making those cupcakes! Can't wait to get my hands on the new magazine! Can't wait to try these! yum! soooooo cool! where will we be able to buy the magazine?! Hi Michele! We'll have more information on where to get the magazine in coming weeks, so feel free to subscribe to the mailing list for the latest news, and I'll definitely be announcing more details here on the blog as well. So exciting - this magazine looks awesome! That is so exciting! 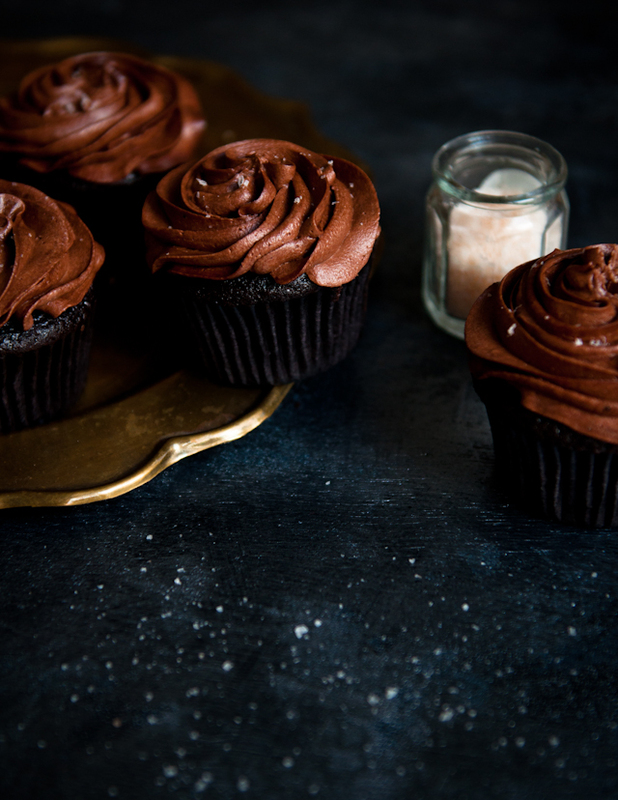 I will be making these Chocolate Earl Grey Cupcakes very soon. Congrats on the magazine!! Can't wait!! So excited for the big news! Also, can't wait to make these cupcakes!! Congratulations!!! I can't wait to see your gorgeous photos in print! And those cupcakes - wow!!! Thank you! This looks AWESOME! Perfect for all my foodie friends. The recipe ingredients list hot coffee but it's no where in the actual recipe. Can you clarify?? oops! Thanks for catching that error. Fixing it right now. A great idea, looks beautiful! congrats on the mag! :D cannot wait to see it. Congratulations, you two! So excited to check it out. Also, followed on Twitter and Facebook. Thanks so much for the recipe & hosting the giveaway! Wow! How exciting! Congrats! Can't wait to view the first issue of the magazine. So fun to see you last night, your photography is so luscious and I can't wait to see sated! now you have me intrigued with earl grey and chocolate, I must try these. Wow. Congratulations! I will definitely be subscribing to the magazine! Just recently I thought how great it would be if there was a "Desserts for Breakfast" cookbook. And now comes sated! I am so excited and of course I would love to be one of the winners for the first issue! Oh goodness, this looks amazing. I can't wait to read the magazine! Those cupcakes look so so rich and chocolatey! I really want to make them! Also, I'm excited about the magazine too! Cupcakes look amazing...can't wait to try them! Surprise Birthday Party here I come. Congrats on the publication! Congrats...looks beautiful. Can't wait to read it! Look so delicious. What an interesting combo! Looks amazing, I can't wait for it to come out! Your dark chocolate cake recipe is by far the best one I've ever had. Seriously. You are amazing - the magazine sounds amazing, and the "preview" recipe looks and sounds marvelous. And to do all that while working on PhD...you are truly, really amazing! And congrats - I can't wait to buy the first issue. Can't wait to see the magazine! What a fantastic idea. Let me know if aspiring food writers have a chance to submit articles! everything about this post makes me so happy. tea, chocolate, photography, giveaways, and a fantastic new magazine - super excited! CONGRATULATIONS, Stephanie!! So excited for you!! so exited! looks great! i love your blog! I am sooooo ridiculously excited for Sated!! Can't wait for the first issue!! Sincerely proud of you two. I can't wait to see the first issue! so excited to see the first issue published! Congratulations! It looks like it's going to be so beautiful! whoo hoo! congrats! can't wait to see read this now. Very exciting! Would love to win! Drumrolls indeed! What great news. I have no doubt sated is going to be beautiful just like your blog! Gorgeous photos as always - and now I'm so excited to see sated - I'm sure it will be stunning! Congrats! It looks beautiful, I would love to get a copy of the first issue! Congrats, its awesome to see hard work and a dream become a reality. These cupcakes sound incredible, I love the tea coffee combination. This is an great idea and I look forward to reading it! Wow Sated sounds amazing! Is this competitions open to international readers? So excited for you! Looks scrumptious! 1) I am obsessed with food photography, 2) I'm obsessed with chocolate, and 3) I LOVE Earl Grey tea! That's a win-win-win! Going to have to try this recipe ASAP. I cannot wait to see this issue. The sneak peak is very intriguing- the recipe looks amazing and the photography and staying is sophisticated and fun. Wow! Cograts! Your photos have always been amazing and I'm excited for the magazine! Sounds delish! Do you use unsalted butter in the icing.. seeing that it is spinkled with salt? Fantastic! Congrats. I can't wait to check it out, and I love the sound (and look!) 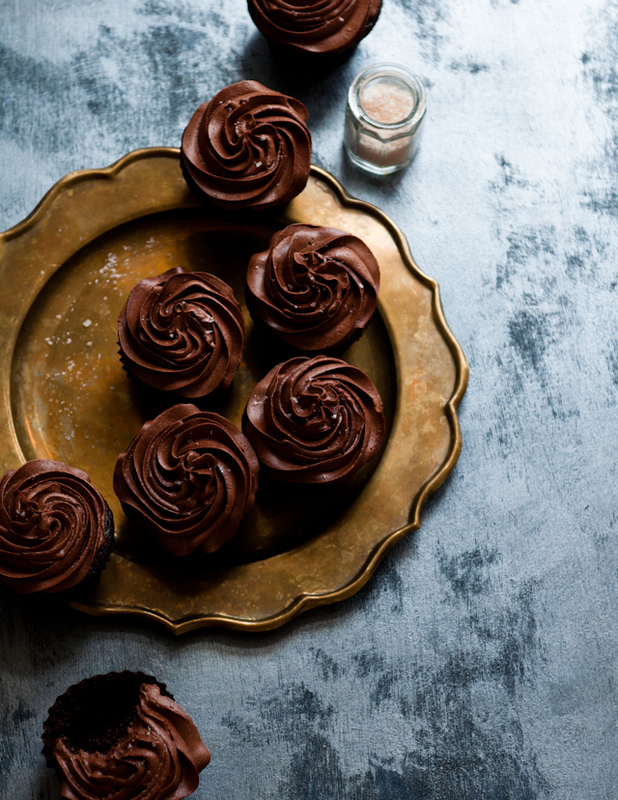 of these cupcakes...chocolate + tea might just be a favorite combination. OMG! So very excited!!! Can't wait to see the first issue!! I am not sure who this appeals to more , the photographer in me or the chocolate lover! So, so happy for you. I would kill for one of these cupcakes right now. Congratulations on this new mag! These cupcakes look amazing! 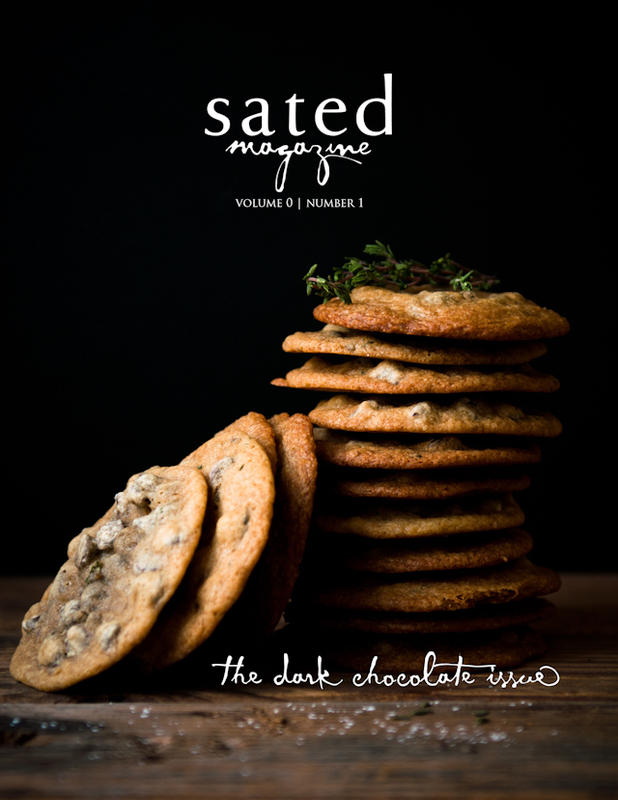 I'm obsessed with dark chocolate and can't wait for the first edition of Sated! That looks like a fab read. Can't wait to see it. Oh my goodness! I can't wait! It looks beautiful! Looks decadent, just how I like it. 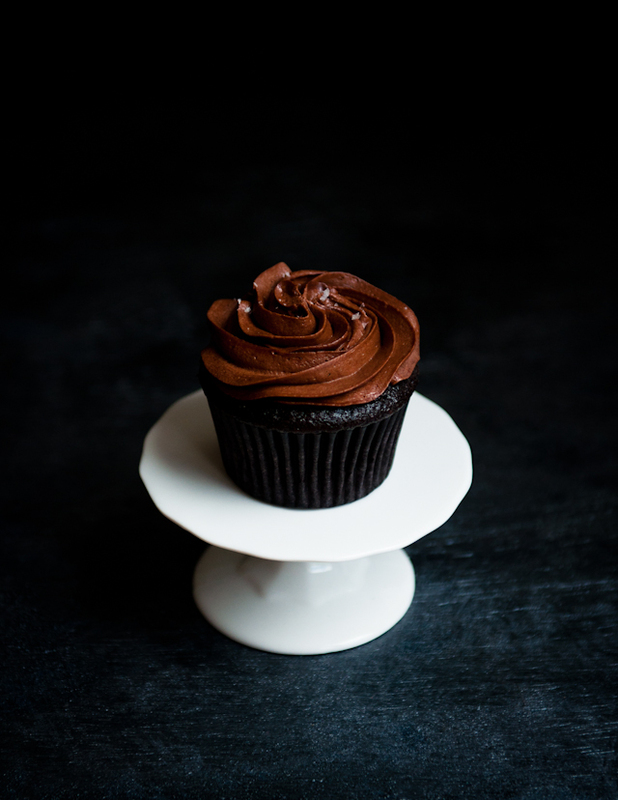 Will be making a batch of those Earl Grey Dark Chocolate Cupcakes for a friends birthday next week. Thanks for the inspiration and congratulations. What a great idea! The magazine will end up being quite a resource for the cook as time goes on! lovely cover...and i can't wait to try those cupcakes. Where can I sign up for a subscription? OMG! I knew you were gearing up for something amazing. I LOVE your work and can't wait for the first issue. Can't wait, it looks amazing! CONGRATULATIONS! I'm so excited for you guys!! ah-may-zhing! very excited for this addition to my "stylish mags" list! Stunning!! Cant wait to see more!! I love the sultry anticipation of these "Special Foods"!! Can't wait to see the rest of the magazine - beautiful job! Wow!! Can't wait to see this!!! Congratulations! I am already salivating. I LOVE chocolate and salt! The cover of your magazine is very alluring...can't wait to see what's inside. I LOVE chocolate and salt! The cover of your magazine is alluring...can't wait to see what's inside! Ditto Robyn's comment! Can't wait to try the cupcakes and can't wait to see the magazine. Congratulations. Congratulations! Love the blog, your photos are amazing! Seriously drooling just looking at them. So exciting! Can't wait to get a copy! Congrats on Sated Magazine, it's absolutely stunning and without question will be a huge success! I'm so happy I was able to meet you the other weekend at the bake sale and then again at the book signing. You're are just so lovely and I hope it works for our paths to cross again in the near future. Oooh! So excited for such a focused food magazine. Also, to try out this recipe! Wow! I just discovered your blog recently and now to discover Sated magazine too and it's all about dark chocolate? Right up my alley! Congratulations and can't wait to dig in to both those amazingly beautiful cupcakes and Sated! if we eat with our eyes, than I am indeed "Sated" after simply seeing the luscious images shown for the upcoming chocolate issue of Sated Magazine! Can't wait to try the early grey chocolate cupcakes at MY house. Thank you for sharing your passion for food with us all! What a fantastic idea! I can't wait to see the first issue in real life! Your pictures are gorgeous and the magazine sounds fantastic! All the best! So excited!! I love food mags, especially with large beautiful photos!! Can't wait to find it! Can't wait to see the new publication. I drool over all of your photos, and I'm sure I'll do the same with the magazine! chocolate + this photography = sensory overload. can't wait for beautiful this magazine! OMG. I'm excited to get this. Will it be IPad accessible? I just found your blog and am so glad. Congrats on the launch of your new magazine! I can't wait to read the first issue! 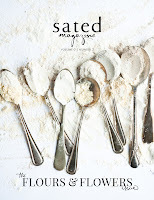 Can't wait to read Sated and drool over the recipes and photos. Love everything you do! I can't tell you how pumped I am to see you two creating this beautiful magazine! Congratulations. I can't wait to read it. In the mean time, can I have a cupcake?! Those look amazing! Congratulations on the magazine, it looks wonderful! Can't wait! Hope I win! would love to receive the mag! oh man i'd love to read this magazine!! Sounds amazing, can't wait to check it out! This magazine looks so cool ... particularly this subject, which is what my grandfather used to work in ... chocolate!! Congrats! I found your blog and therefore the news of the Sated Mag via Dessert First. Chocolate is a great theme for a 1st issue. Very interesting frosting idea and pictures look amazing! I'm excited to hear about this! Can't wait for the first issue. The pictures are making me so hungry for dark chocolate. What a great idea to start with this theme! this + chai cupcakes are going on my baking next list! beautiful & scrumptious. what if I don't have a paddle attachment?? would it screw up the frosting to use a different one? I am definitely going to make this! Seems like an amazing recipe. It's great to have a new and fresh food publication to look forward to! Thank you! I would love to win the contest. That cupcake looks magical! Love the photography as well, I am sure the mag is going to be fantastic! Very excited to see the magazine! I sincerely think you have some of the best food photography on the internet. I adore the rich, deep colors, and the unabashed use of darkness in an ocean of white-washed Donna-Hay-esque food shots. Best of luck with the new venture! i will make these cupacakes tomorrow!